Roadside markers mean roads, of course. Blacktop, hazard lights, and dodging traffic to reach the sign off the opposite lane of the state highway. But we’re also talking roadside, and that’s where the greenery comes in. New Hampshire’s Department of Transportation contracts the seeding of flowers along sections of interstates (and some state routes, too). To find out more about that program, you can contact NHDOT’s landscape specialist. In this post, though, I’m talking about real wildflowers: the kind that crop up in empty lots, forest floors, and other uncultivated places. Rugged plants undiscouraged by poor soil, odd drainage, and the occasional wheel crushing. Natives, welcome wanderers, or invasives, they add interest and beauty to our travels. These are some of my favorites, grouped road warrior-style, by how you can find them in New Hampshire. You don’t need to stop the car to enjoy these showy gems. In fact, you may have some in your yard; it’s just that the delight of serendipitously spotting these in passing can’t be beat. Day lilies: You see these close to houses. The bright orange “classic” variety were imported from Europe and live in drainage ditches because gardeners thinned a patch and simply tossed the corms (bulbs) out of the planting area. See them late June through late July. Black-eyed susans: The wild ones are mostly yellow-petaled. They are typically biennial, which means you don’t see flowers until year two. If you want these at home, try taking a seedy deadhead home and scattering the seeds. Blossom mid July-mid September. Rosa rugosa: Also known as beach rose. They love nutrient-poor, sandy soil, which is why they make great dune borders. They’re technically invasives, but I haven’t heard the complaints about them as I have over the Dreaded Purple Loosestrife, which one must admit is quite pretty, too. 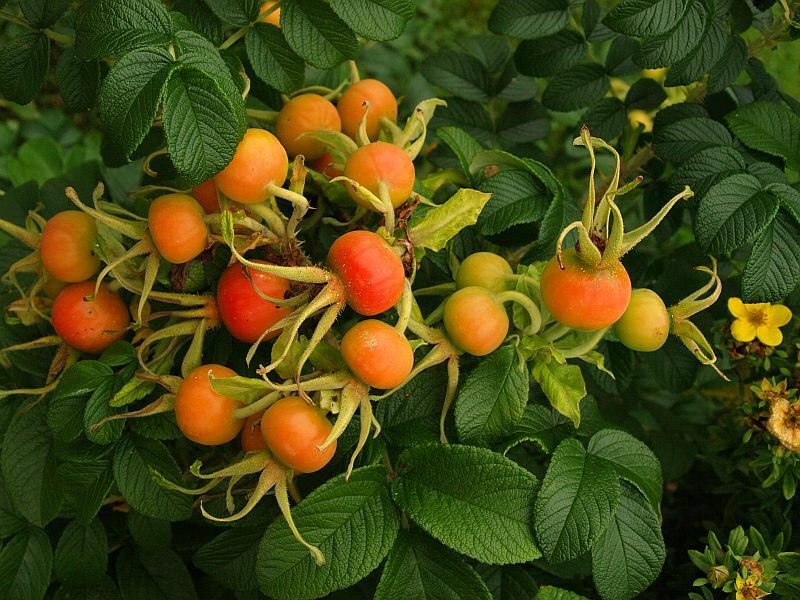 Roses flower in June, then develop attractive fruit called rose hips that make good tea, jam, and wild fauna food. These charmers are little; you can see them best by getting your face right down close. Fortunately, they tend to like more grassy companion plants than those three listed previously. I name them in the plural because they can color the ground when in number. 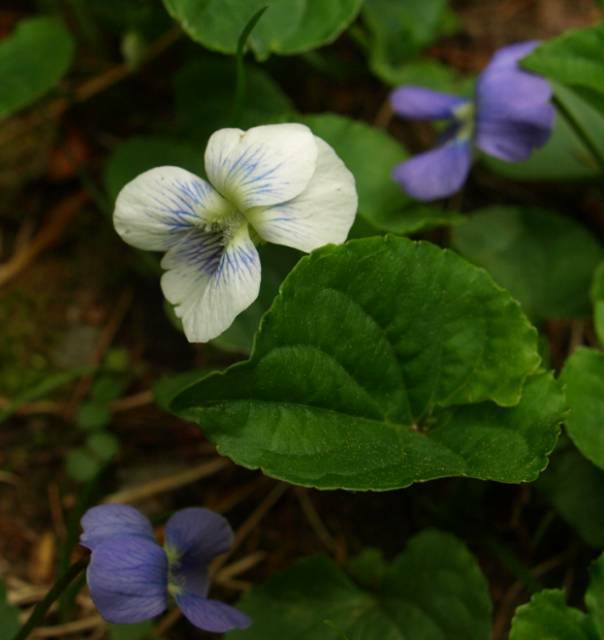 Violets: I know that you can identify violets. I’m just saying that they’re lovely, especially in number. They bloom in our yard just before the lawn gets too long to obscure them, in May. Orange hawkweeds: AKA orange paintbrush, red daisy, flameweed, devil’s weed, grim-the-collier, devil’s-paintbrush, fox-and cubs, king-devil, missionary weed. Look rather like dandelion flowers, but with a few differences. 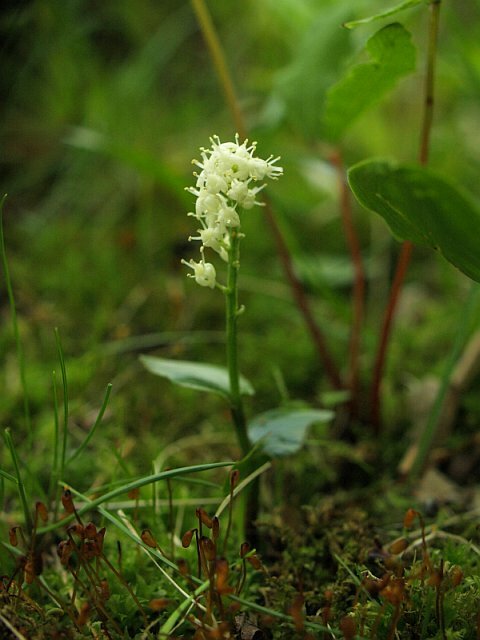 First, the flowering stalks produce a group of flowers, rather than just one. Also, they have simpler shaped leaves, not the spiky “lion’s teeth” type. If you consider them as weeds (i.e., they’re growing in your lawn), they pull up easily. They seed with the same white blowaway puffballs. The first 15 Google sources I saw about hawkweed were “noxious plant” sites, i.e., invasives. Durn them ferners! 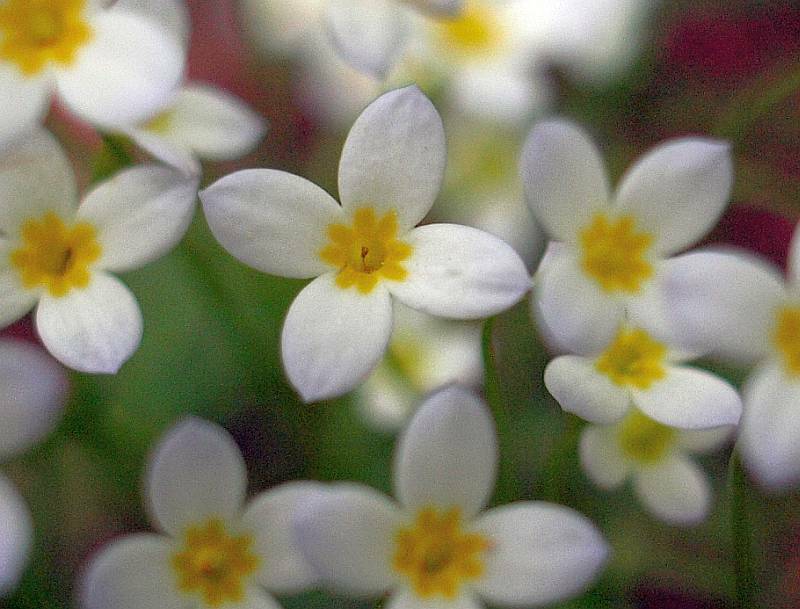 Bluets: These are super-tiny (blossom-span about ½ inch) and the palest blue. Also known as quaker ladies, they tend to grow in little bunches. You can see them by squinting toward the ground in the spring months. You’ll probably see these from a distance, but need to get out of the car to really appreciate these flowers. Here’s your vocabulary word of the day: these plants are ruderal, meaning they like lousy, disturbed soil such as that found on roadsides and in vacant lots. Common mullein: These are weird, phallic beasts that can grow to over six feet tall in their second year (they, too, are biennials). The long flowering stalk is covered with myriad yellow florets. They can flower any time between June and September. Butter and eggs: A much nicer name than its Latin, Linaria vulgaris, or other common name, common toadflax. Not to bicker, but the inner orange is more like egg yolk, and the outer like egg white (except in the variety with light yellow instead of white). At least I agree that the name properly attributes richness to the coloration. They last well in a vase arrangement. Look for them June through October. Bouncing bet: Or common soapwort, crow soap, wild sweet William, or soapweed. Colonial-timers might have called a perky English washerwoman “Bouncing Bet,” and apparently, the plant produces a juice that lathers up soapily, neutralizing parental complaints toward children who tumble around in the scrub. These also bloom long, from June to October. These plants seem happier in woodsy soil, so they’re technically not usually roadside. But they round out a bunch of my favorites, so here you are. Canadian mayflower: I used to think of those single glossy heart-shaped leaves under the evergreens as lame-os of the kingdom Plantae. It turns out that, when they grow their second leaf, and if it’s May (Mother’s Day weekend is ideal), you’ll see their sweet little blossoms, which call to mind a half-gone puff of smoke. 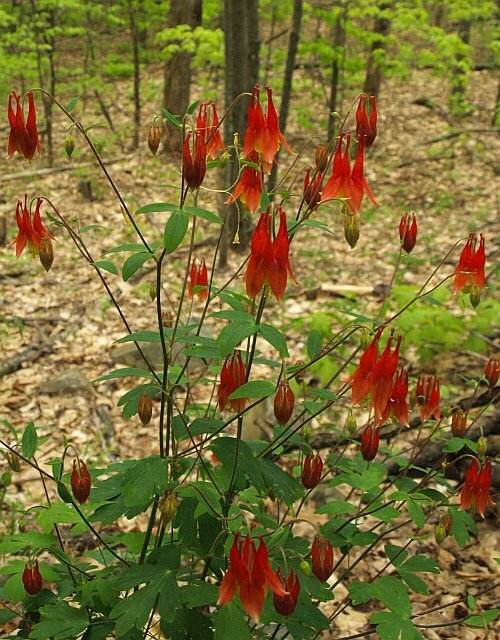 Columbine: These are specimen plants of the wild (but if you want one, go to a garden center, please). Finding one will make you glow inside, as if you’ve uncovered buried treasure. 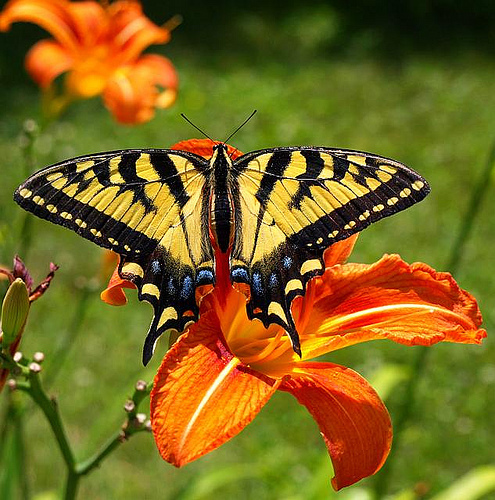 Unmistakable in yellow and red splendor, nodding spurred flowers on graceful slender stalks. Again, hiking in the woods on Mother’s Day will improve your chances of seeing one. Lady’s-slipper: Round out your May walk by spotting a rare orchid. “Showy” is pink-lipped and white petaled (and native); “yellow” is, well, yellow, but with reddish-brown petals and sepals (petal-looking things that are not petals, to use the botanical definition). These are technically not illegal to dig up and transplant, but don’t waste your time or ruin the chance find of another hiker–they’re virtually impossible to grow outside of the nanoenvironment where you find them. 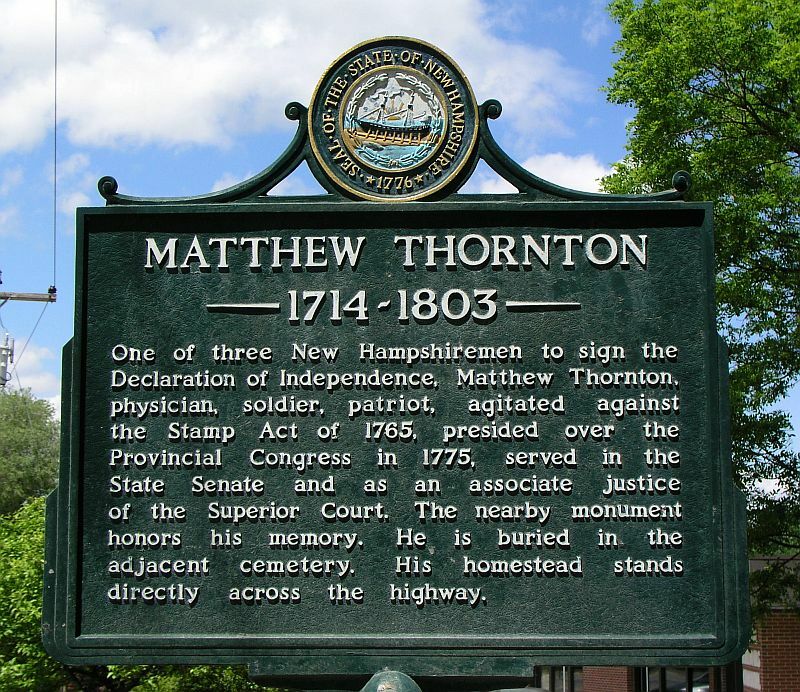 One of the three men to sign the Declaration of Independence, Matthew Thornton, physician, soldier, patriot, agitated against the Stamp Act of 1765, presided over the Provincial Congress in 1775, served in the State Senate, and as an associate justice of the Superior Court. The nearby monument honors his memory. He is buried in the adjacent cemetery. His homestead stands directly across the highway. Location: Northbound side of Route 3 in Merrimack, north of its intersection with Greeley Road (the eastbound road off exit 11, Edward Everett Turnpike). ALTHOUGH the sign commemorating this national-level notable is located in Merrimack, it was only after his retirement from his many activities that Matthew Thornton moved here to become a gentleman farmer and ferry operator. Presumably, he maintained his wit and humor, as exemplified by the following excerpt from a 1777 letter from John Adams to his wife, Abigail. We have from New Hampshire a Coll. Thornton, a Physician by Profession, a Man of Humour. He has a large Budget of droll Stories, with which he entertains Company Perpetually. I heard about Twenty or five and twenty Years ago, a Story of a Physician in Londonderry, who accidentally [met] with one of our new England Enthusiasts, call’d [Exhorters]. The Fanatic soon began to examine the Dr. [concerning] the Articles of his Faith, and what he thought of original Sin? Why, says the Dr., I satisfy myself about it in this manner. Either original Sin is divisible or indivisible. If it was divisible every descendant of Adam and Eve must have a Part, and the share which falls to each Individual at this Day, is so small a Particle, that I think it is not worth considering. If indivisible, then the whole Quantity must have descended in a right Line, and must now be possessed by one Person only, and the Chances are Millions and Millions to one that that Person is now in Asia or Africa, and that I have nothing to do with it. I told Thornton the story and that I suspected him to be the Man. He said he was. He belongs to Londonderry. Thornton’s house is currently a restaurant. The surrounding neighborhood is still called Thornton’s Ferry. And though the ferry is long gone, no bridge has been built to replace it. Hunter, trapper, fisherman and guide, well and favorably known by the region’s early settlers. “The Lone Indian of the Magalloway” was the last survivor of a band of Abenaki inhabiting the Upper Androscoggin. Blinded by accidents, Metallak died a town charge in 1847 at the reputed age of 120. He is buried in the North Hill Cemetery on road to the east. The marker, number 47, is located in Stewartstown on the east side of NH 145, about 1 mile north of Stewartstown village. Even his marker was mysterious–at least, it was a mystery where it was this day. WE GOT a strange letter about this one. Several days after visiting this marker, said the writer, Metallak himself, “or something resembling him…materialized out of a dense cloud” at the foot of the bed for perhaps half a minute, waking him and his wife from a sound sleep. His letter assured us that they were rational people who didn’t then, and still don’t, believe in ghosts. But something appeared to them in the middle of the night. Some believe that Metallak had visited from the other side before, speculating that plans to cash in on his name angered the spirit of the old Indian. The Metallak was to be a grand hotel on Lombard Hill above Colebrook before it suffered a series of setbacks during its construction and blew down in an April gale in 1893, never hosting a single guest. Exact details of Metallak’s life are hard to pin down—even his would-be biographer, Alice Daley Noyes, citing “long and sketchy gaps in Metallak’s life,” classified her book Metallak, His Legacy a work of fiction. The state marker notes that he was the “last survivor of a band of Abenaki” on the Upper Androscoggin. Other accounts say he was not the last of his band. Probably he was the last of his band to live there, the rest (including his children) having earlier moved to Canada as more white settlers cleared farms and built towns in northern New England. Metallak remained, continuing to hunt, trap, and fish, befriending his new neighbors, sometimes serving as a guide. 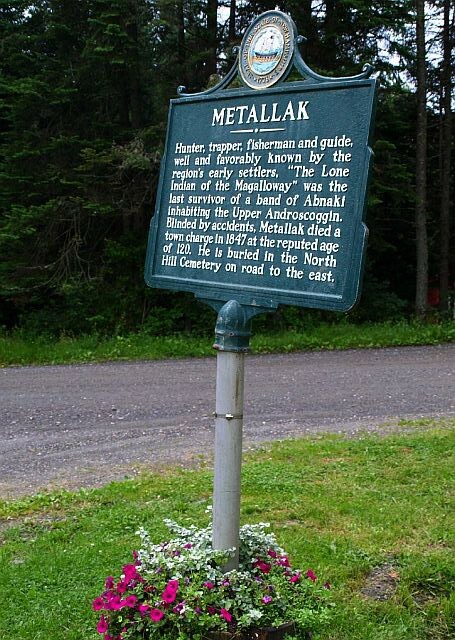 Metallak’s marker was back up the last time we drove by–maybe it was just a snowplow and not his ghost the time before. One or two accidents cost Metallak his eyesight—accounts vary: a splinter while chopping wood, a tree branch, a sewing needle. Hunters or neighbors—or hunting neighbors—rescued him, blind and starving, and his children took him to Canada to live with them. Somehow he ended up back in Stewartstown, New Hampshire, destitute, and a ward of the town. Back then, the poor who could not support themselves were more or less auctioned each year to the lowest bidder, who would be paid by the town to care for them. This is how Metallak lived his last days, dying in 1841—or 1847—at the age of 102—or 120. If you notice anything strange when visiting this marker, drop us a line. Okay, maybe it’s time to paint. New Boston. Atlas—check; marker list—check; cameras—check; pretzels—check; water—check. We get our usual early start, just after the crack of noon. We’re aiming for #228, Cork Plain Bridge – Second New Hampshire Turnpike in Antrim. The marker was placed in 2011, but we haven’t seen it yet. We go by way of New Boston, Francestown, Greenfield, and Bennington, back roads mostly. I don’t ask Mary to stop for some nifty tractors (two Farmalls and some Massey Fergusons); we’ve got somewhere to go. We roll through New Boston, past the Molly Stark Cannon Marker (#146), past the Gravity Research Institute stone.Ooh, a tumble-down farmhouse—can we stop here? Just for a minute. A false stop in Antrim village for New Hampshire’s Last Soldier of the Revolution (#178) which we’ve already bagged, but I snap a photo anyway, and some more of the town hall and gorgeous houses. Mary has an idea of where #228 should be. She’s our navigator. I can get lost going downstairs in the morning. When we get underway again, Mary’s aim is true, and we find the marker on Route 202. 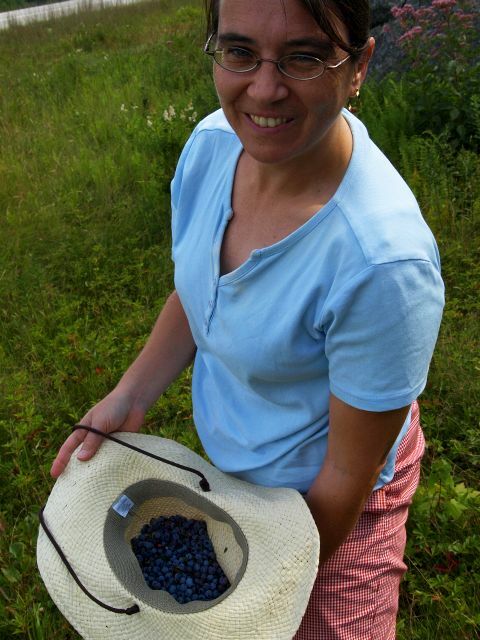 While walking through the underbrush surrounding the marker for the money shot, Mary spots blueberries. We pick a quart. Sunday morning we’ll have blueberry pancakes and maybe, later, a pie. 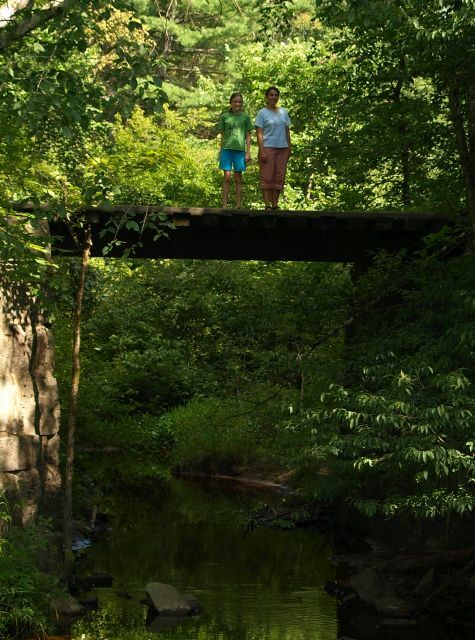 We loop back around Old Concord Road and find the bridge site. This is the replacement for the one in the marker, which was dismantled in 2009. Wish I’d thought to get a picture back then. Old Peterborough and Hillsborough Railroad bridge, now part of a rail trail. Hillsborough. Taking back roads north to Hillsborough, we cross the old Peterborough and Hillsborough Railroad, now a railtrail. 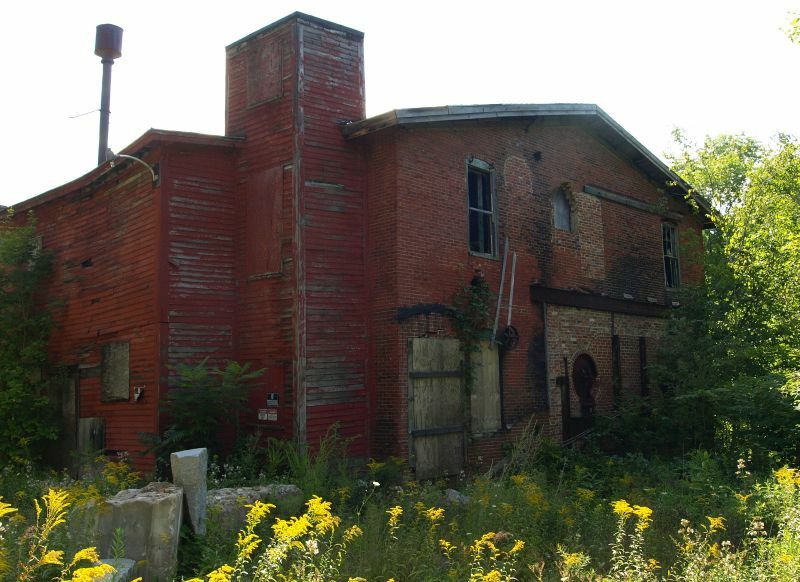 Just before the bridge over the Contoocook to downtown Hillsborough, we spot some old mill buildings—well, the roof of an old mill, really, just down the steep hillside—and pull off to the side of the road. Some folks are moving things into a storage bay, and I ask them if it’s okay to scramble down the hill to explore. “Why don’t you ask her? She owns the place,” says one of them. Abandoned Wood Woolen Mill, Hillsborough. The company name was “Wood,” the mill is made of brick. Hillsborough. 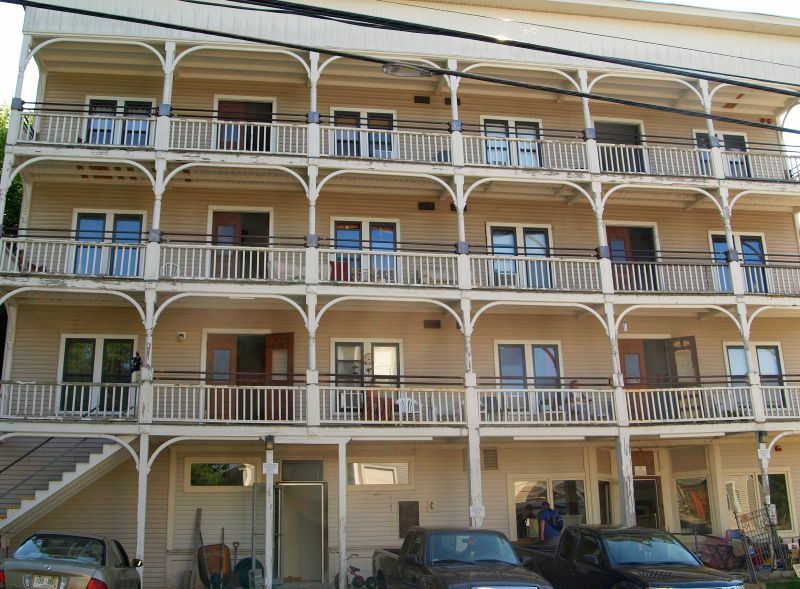 The owner is Liz, and she owns the whole building, an old warehouse with three tidy apartments in addition to the bays. She says it would be fine, but to follow her down her stairs, instead. She takes us around the other side of the building and down some steps, stopping to show us her wonderful abode in the ground floor of the old warehouse. She and her late husband had created their beautiful home under the massive old beams and wooden floors, hidden from the street, but with a delightful back garden overlooking the river. She walked with us back to the mill buildings and told us, “my kids want me to move out of here, but I won’t.” I don’t blame her one bit. The mill buildings, once the Woods Woolen Mill, now belong to the town. 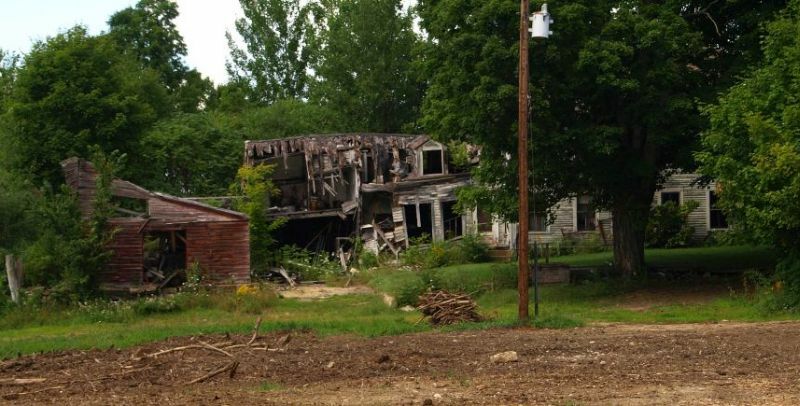 She said the town planned to restore them for some purpose or other, but she doubted they ever would. “A man wanted to buy them, but they said no.” We thank her for her kind tour and cross the river in the mill district. 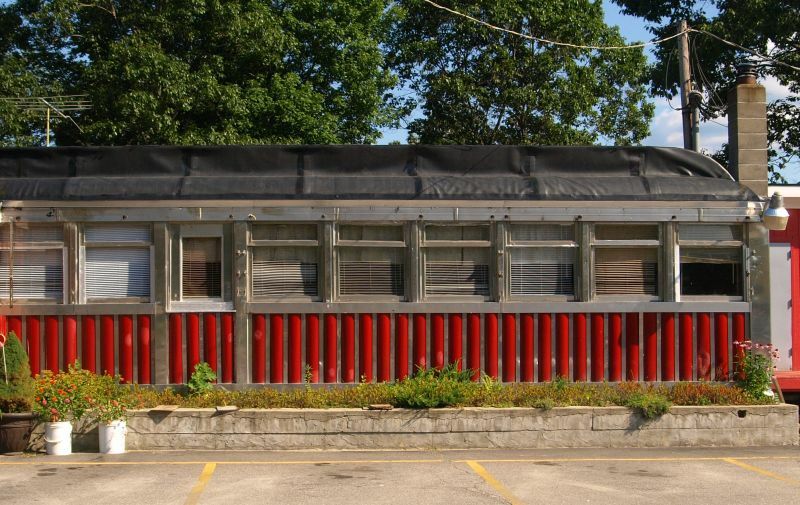 Hillsboro Diner, formerly Caron’s Diner, a 1940s-vintage Kullman diner car from New Jersey. Don’t take my picture! Hillsborough. We roll by the Hillsborough Diner, but they close soon after lunch, these days, even on a Saturday. I’m just glad they remain open at all. We make one more stop right at the bridge where I snap a photo of an impressive wooden apartment building where a gentleman informs me that taking pictures of someone else’s property is illegal. I don’t argue the point, and look over the permanent yard sale on the corner as a conciliatory gesture. 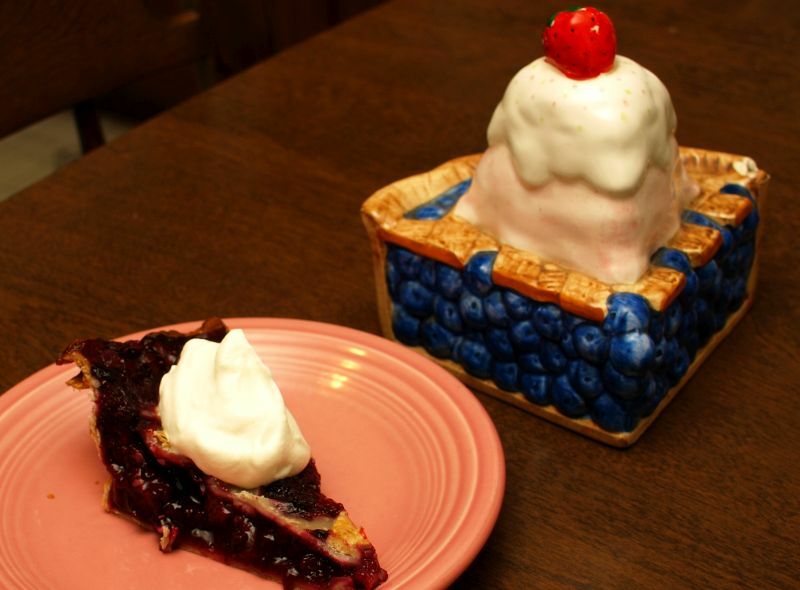 There’s a ceramic blueberry-pie-alamode music box with a chipped corner and I buy it, with thanks, but assurances that I shouldn’t be taking pictures of other people’s buildings. A last stop for a drive-through dinner, and we’re on our way home, ready to download the photos and begin research for the next blog entry. Oh, and to eat those blueberries. Just north of this point, on the boundary between Bow and Concord a large cavalcade of enthusiastic citizens met Andrew Jackson and escorted him to New Hampshire’s Capital. His official reception by the State Government on the following day, June 29, 1833, marked the conclusion of a triumphal New England tour. Located on the west side of NH 3-A in Bow at its intersection with Interstate 89. Bob’s hiking buddies Jim, Dave and Gordon, sometime between 1997 and 2001. This is right by the Park-n-Ride lot in Bow, and we all met here fo car-pool up for a hike in the White Mountains. Poor health and constant pain took its toll on President Jackson near the planned apogee of his tour of the Northeastern United States, forcing him to cancel a visit to Portland, Maine, and turn around for Washington after reaching Concord. The pain was no wonder: Jackson fought so many duels in his younger years–mainly over the honor of his wife–that one wag said that he rattled like a bag of marbles from all the lead in his body. Jackson is widely credited with bringing modern politics into the gentlemen’s game of governing, introducing the spoils system and the prominence of political partisanship. Washington had been received by pan-political delegations representing the cities and states he toured; Jackson was received almost exclusively by members of his own party (Democrats). The American novelist – Winston Churchill (NH #16) – addressed the partisan and populist political system that would become known as Jacksonian Democracy in his bestseller Coniston, which would be set in a thinly-veiled Croyden, New Hampshire. 1Naming towns for presidents is nearly as popular a sport in New Hampshire as is naming mountains for them: Washington, NH was the first town in the Republic to be named for its first president, and Jefferson, Madison, Monroe, and Lincoln would follow. Curiously, there is no NH town named for Franklin Pierce, the only chief executive born in the Granite State. 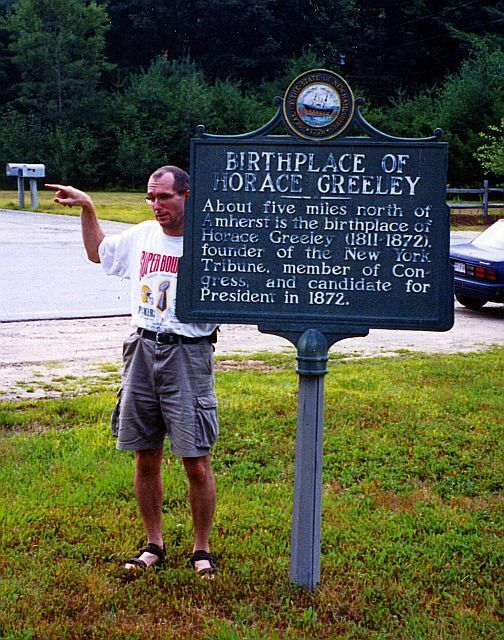 About five miles north of Amherst is the birthplace of Horace Greeley (1811-1872), founder of the New York Tribune, member of Congress, and candidate for President in 1872. Located about 9 miles west of Manchester at the intersection of NH 101 and Horace Greeley Road. I think that’s west–maybe a little south. Hard to say, really. IF THE MARKER text above seems strangely brief, remember that it’s better to say too little than too much. In 1820, Greeley’s father fled the simple center-chimney Cape up what is now Horace Greeley Road to escape arrest for unpaid debts. Greeley was a member of Congress for only three months, finishing the term of a deceased member from his district. And the Presidential campaign was a tragic punctuation to an otherwise impressive career. Losing the election in a landslide, he realized unhappily that his beloved Tribune was being taken over by his managing editor. Days before the election, his wife died. He collapsed in madness, dying in a sanatorium shortly after the election (in which he earned either zero or three electoral votes, depending on the source you trust). “Uncle Horace” kept America’s interest with his public eccentricity, both intellectual and personal. He described himself as “long-legged, gaunt, and most cadaverous of visage, ergo, homely….bent like a hoop,…[and] slouching in dress.” Any subject worth contemplating earned his stout approval or condemnation. He advocated the using Sylvester Graham’s “health flour” (we know him for his graham crackers) and avoiding smoking and strong drink, but risked his very life in support of Abolition. During the 1863 New York City draft riots, trapped in the Tribune building by an angry mob demanding his neck, Greeley faced them down. The rioters stormed the building, but only after he left by the front door. In his day, Horace Greeley was a virtual celebrity; today, we remember him mainly for a quotation he never actually said. “Go West, young man, go West!” was sloganized from one of his wordier editorials about westward expansion. Dec. 14-15, 1774, several hundred men overpowered the small British garrison at Castle William & Mary, now Fort Constitution, New Castle, and removed quantities of military supplies. 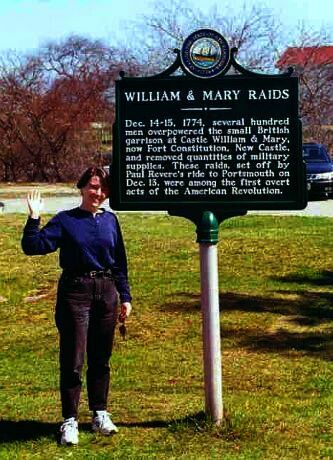 These raids, set off by Paul Revere’s ride to Portsmouth on Dec. 13, were among the first overt acts of the American Revolution. Located near the intersection of Main Street (NH 1-B) and Wentworth Street in New Castle. Fort Constitution was listed on the National Register in 1973. 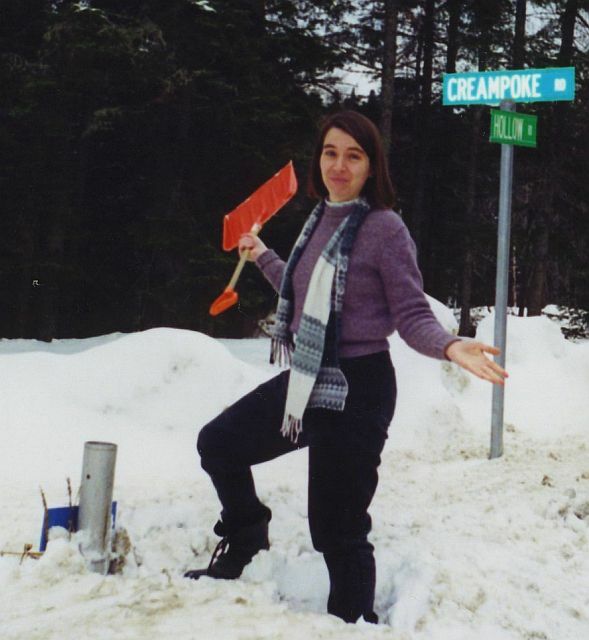 This is one of our earliest marker photos from when we first started tracking them down in 1997. ASK ANYONE outside of New Hampshire about Paul Revere’s ride and they’ll tell you about one he never even finished. 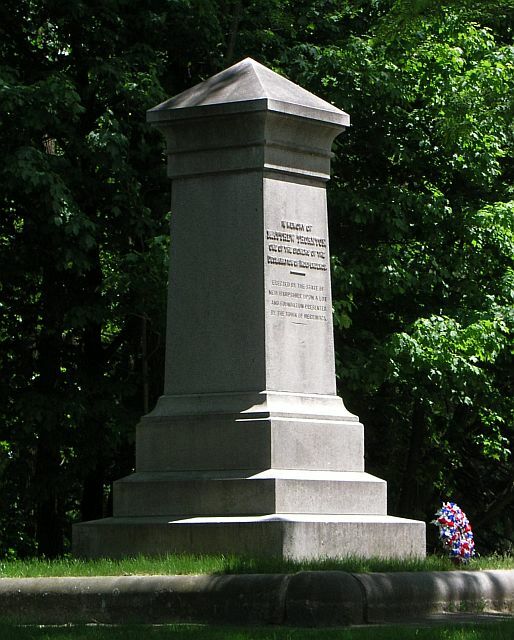 In 1774, he rode all the way to Portsmouth where he helped start the Revolution months before Concord and Lexington. Word of the tea party in Boston reached Portsmouth in December of 1773, and while no tea was spilled in New Hampshire waters, a merchant who had prudently removed a tea shipment from his Portsmouth warehouse to Halifax, Nova Scotia, had his house windows broken by an angry mob. When Royal Provincial Governor John Wentworth pushed to strengthen the garrison at Fort William and Mary against local unrest, the Provincial Assembly balked, granting only enough money for an officer, three men, and their equipment. When Governor Wentworth later threw the assembly out of their chamber for holding what he called an illegal meeting, they moved to a local tavern and planned for a Provincial Congress to meet later in Exeter. That body moved to send aid to the occupied and blockaded Boston. Word of restrictive Acts of Parliament and a rumored secret arms embargo against the colonies traveled just ahead of Revere, and his arrival bolstered other rumors of a British ship from Boston carrying troops to occupy Portsmouth. The very next day, about 200 men gathered in Portsmouth and started to march to the fort. The small garrison at Fort William and Mary (a Captain Cochran and five men) were warned that this angry mob was headed their way. By the time the mob reached the gates of the fort, it had swelled to 400 with the addition of men from New Castle and Rye. Shots were fired. No one was hurt, but the defenders were overwhelmed. Nearly 100 barrels of gunpowder were spirited out of the fort and loaded on moses boats and gundalows to be hidden in nearby towns—half of it in Durham and Exeter. Meanwhile, back in Portsmouth, Wentworth sent word to the British command in Boston to send ships and soldiers, pronto. John Sullivan and other men from Durham surrounded the Province House, demanding to know if British reinforcements were coming—remember, that’s how this whole thing started—the Governor coyly replied that “none were expected.” The Durham men dispersed but reassembled later to finish pillaging the fort. Then things started happening fast. 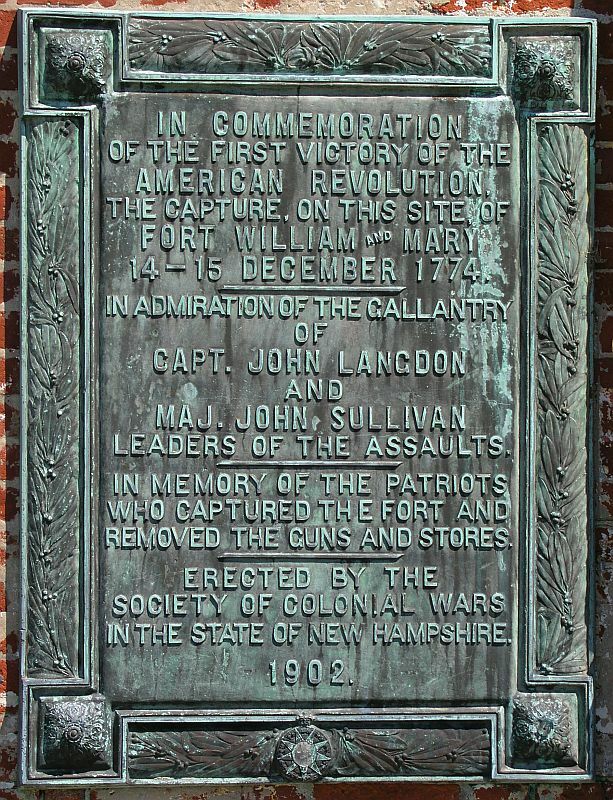 By the end of May, 1775, rebel militia started to occupy Portsmouth. On the 13th of June, the Governor found it prudent to move from his mansion to the fort, now back in Crown hands and under the protective guns of the H.M.S. Scarborough. On the 17th, New Hampshire men outnumbered those from either Massachusetts or Connecticut at Bunker Hill, and it’s likely that some of the powder seized during these raids found its way there. On June 23, the Governor and his family boarded the Scarborough and sailed to British-occupied Boston.1 When Governor Wentworth sailed out of Portsmouth Harbor, New Hampshire was completely free of British occupation and rule, the first of the thirteen colonies to be so. 1 The Governor’s career wasn’t quite over, though it did take a step or two back. After a multi-stage retreat (Boston-to-Nova Scotia-to-London), Wentworth returned to North America as the Lieutenant-Governor of Nova Scotia and spent the rest of his life there. When he died in 1820, he was buried in the crypt of St. Paul’s Church in Halifax, which still stands, making it the oldest building in Halifax (1750), and the oldest surviving Protestant church in Canada. When the Diocese of Nova Scotia was created in 1787, it became the seat of the Bishop and the first Anglican cathedral outside of Great Britain. 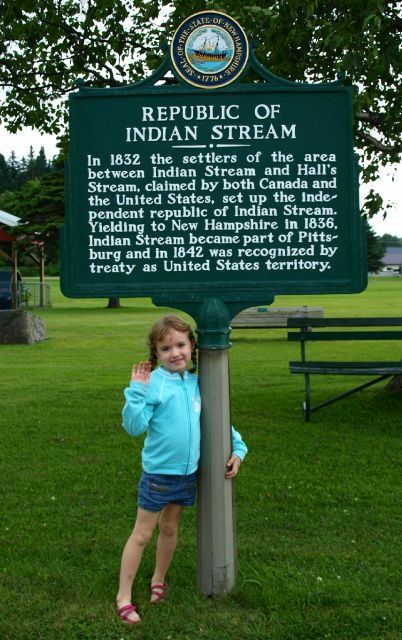 In 1832 the settlers of the area between Indian Stream and Hall’s Stream, claimed by both Canada and the United States, set up the independent republic of Indian Stream. Yielding to New Hampshire in 1836, Indian Stream became part of Pittsburg and in 1842 was recognized by treaty as United States territory. Located on the north side of US 3 in Pittsburg at the Town Park. The kid under the sign is a lot taller now, and starting to declare her own independence. SOMETIMES THE LINES blur at the edges of society. The 1763 Treaty of Paris concluding the French and Indian War referred to a map created by surveyors and cartographers who didn’t head very far north beyond the comfortable reaches of Concord. This map depicted the Connecticut River continuing due north beyond the 45th parallel. As Great Britain was only drawing boundaries between its own territories, they wasted no time in niggling about actual headwater routes as they determined the border between New Hampshire and Quebec. It was to be along the route of the Connecticut River, with New Hampshire to the south and east of the waterway now called Hall’s Stream. The 1783 Treaty of Paris formalized the independence of the United States and accepted the drawn border. Later surveyors and settlers traveling to the region discovered that the river’s source is better described as the stream that continues through Lake Francis and the four Connecticut Lakes, more from the northeast (today this stream is indisputably called the Connecticut River). But no one troubled much. The land was little developed between here and Montreal and Quebec City to the north, and the rugged White Mountains effectively cut off the parcel from the south. One day, though, the unavoidable happened. British and American governments realized that the residents of this isolated enclave were not paying taxes. Additionally, the British were ready to press able men into military service. In the Indian Stream region (so called because Indian Stream, the third possible headwater of the Connecticut, bisected the disputed area), factions expressed divided allegiances between the two nations. In 1832, tiny Indian Stream declared itself an independent republic, complete with a constitution and three branches of government. Things progressed smoothly until 1835, when an official of the Republic was hired to execute a Canadian warrant on Republic President Luther Parker. Parker was arrested, but a band of supporters freed him and invaded Canada to kidnap an official. With an international incident on their hands, British and American governments finally stepped up to settle the boundary dispute. The westernmost boundary, the one approved in the 1783 Treaty of Paris, was determined to the official border between the United States and Canada, and the citizens of Indian Stream acquiesced, joining the United States. 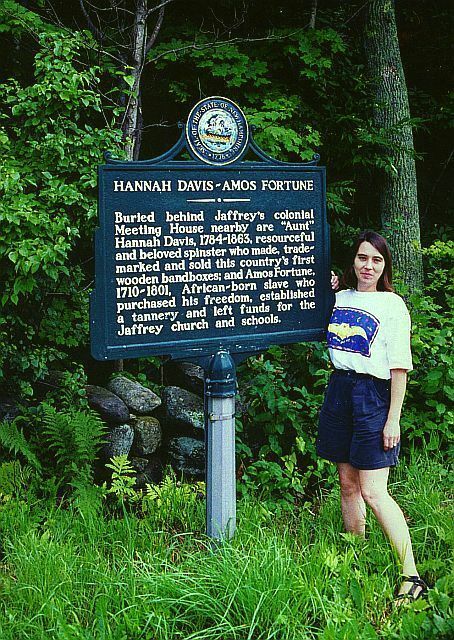 Buried behind Jaffrey’s colonial Meeting House nearby are “Aunt” Hannah Davis, 1784-1863, resourceful and beloved spinster who made, trade-marked and sold this country’s first wooden bandboxes; and Amos Fortune, 1710-1801, African-born slave who purchased his freedom, established a tannery and left funds for the Jaffrey church and schools. 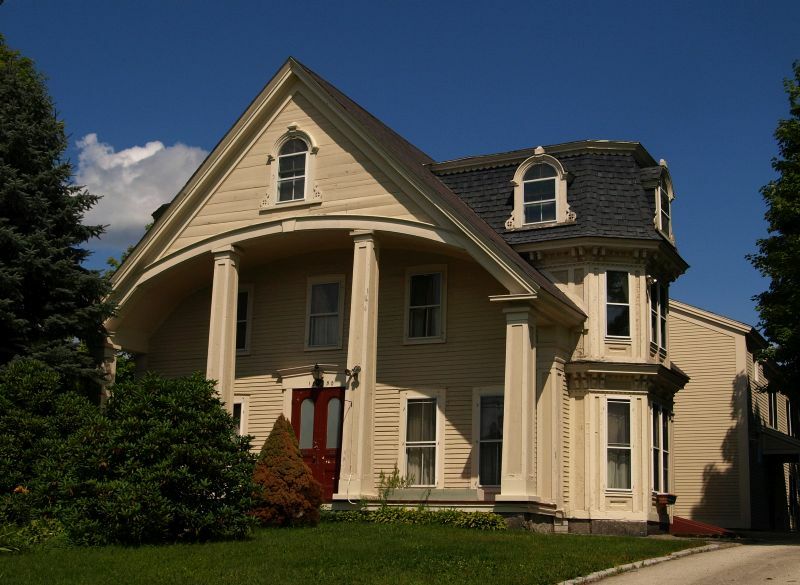 Located in Jaffrey Center, on the south side of NH 124, about 2 miles west of its junction with US 202. 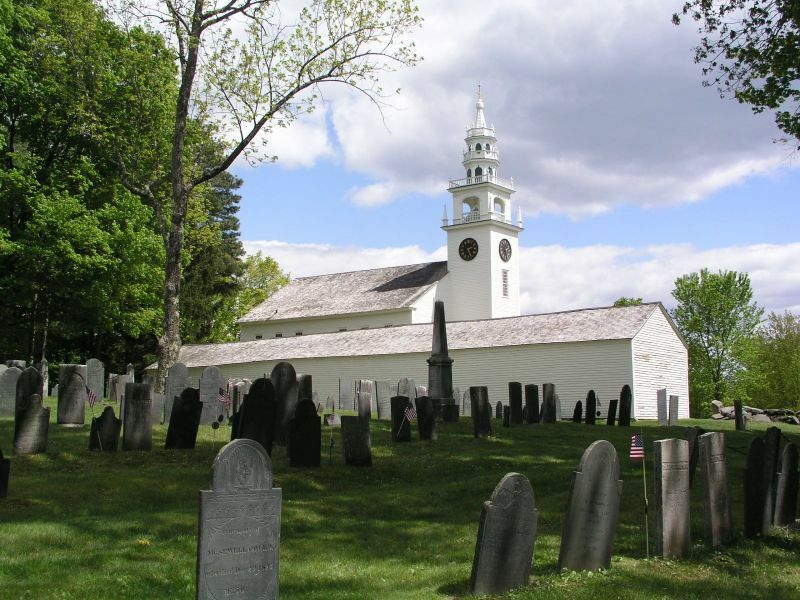 The Cemetery is a short distance west of the marker on a green with the meeting house and the historic Little Red Schoolhouse. THERE’S A SURPRISE at this cemetery, worthy of a marker itself—but we’ll get back to that later. At first, the pair commemorated on this marker might seem an odd combination, an orphaned woman and a slave two generations apart. But both faced long odds, and both thrived. Hannah Davis supported herself by making spruce bandboxes on machinery of her own design. She covered the boxes with wallpaper and lined them with newspapers. 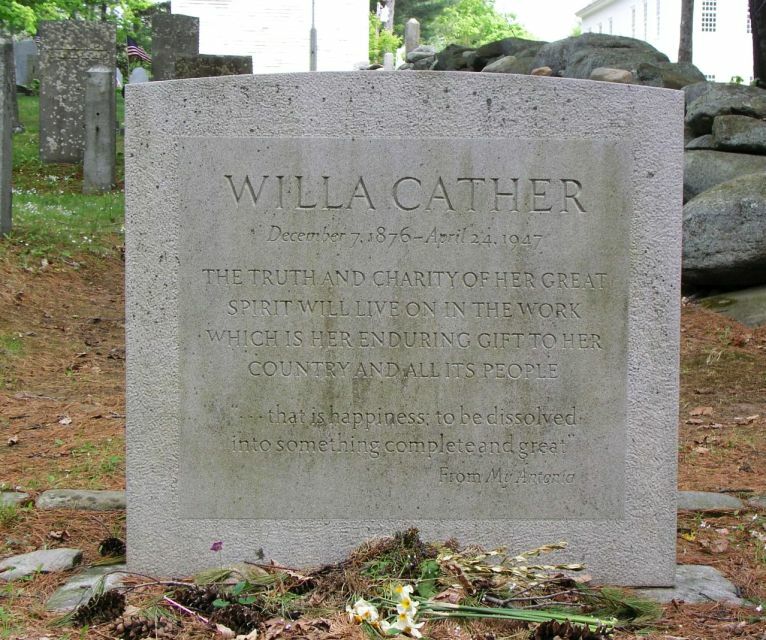 She marketed them herself, carrying wagonloads to mill towns around New Hampshire and Massachusetts where she would sell them to the young women who worked in the mills. They used them as hatboxes, containers for their simple trinkets and treasures, even suitcases. Her bandboxes are prized by collectors today. Amos Fortune worked as a tanner for his master in Woburn, Massachusetts, eventually purchasing his freedom, moving to Jaffrey, and establishing his own tannery. If that were the whole story, it would be a good one—one man’s struggle for freedom and prosperity—but his headstone and the one next to it tell another, more intimate story. SACRED to the memory of Amos Fortune who was born free in Africa, a slave in America he purchased liberty professed Christianity lived reputably died hopefully. Nov. 17, 1801 Æt. 91. SACRED to the memory of Violate by sale the slave of Amos Fortune by Marriage his wife, by her fidelity his friend and solace, she died his widow. Sept. 13, 1802 Æt. 73. THE TRUTH AND CHARITY OF HER GREAT SPIRIT WILL LIVE ON IN THE WORK WHICH IS HER ENDURING GIFT TO HER COUNTRY AND ITS PEOPLE. In several versions the legend’s sequence relates the mysterious death of Chocorua’s son while in the care of a settler named Campbell. Suspicious of the cause, the Pequawket chieftain took revenge on the settler’s family. Then, in retaliation, Campbell killed Chocorua on the peak of the mountain now bearing the Indian’s name. Located by Chocorua Lake on the west side of NH 16, 3.5 miles north of its junction with NH 113 in Tamworth. BOB AND I started bagging sign photos on the first full day of our honeymoon. As a child, I had ridden past this sign innumerable times, never reading past the title. We decided that our wedded bliss should also bring driving leisure, and we finally stopped the car. The years have passed, the back seat’s gained an occupant, and we continue to visit the markers and the interesting sites around them. Chocorua’s story is the stuff of true legend. 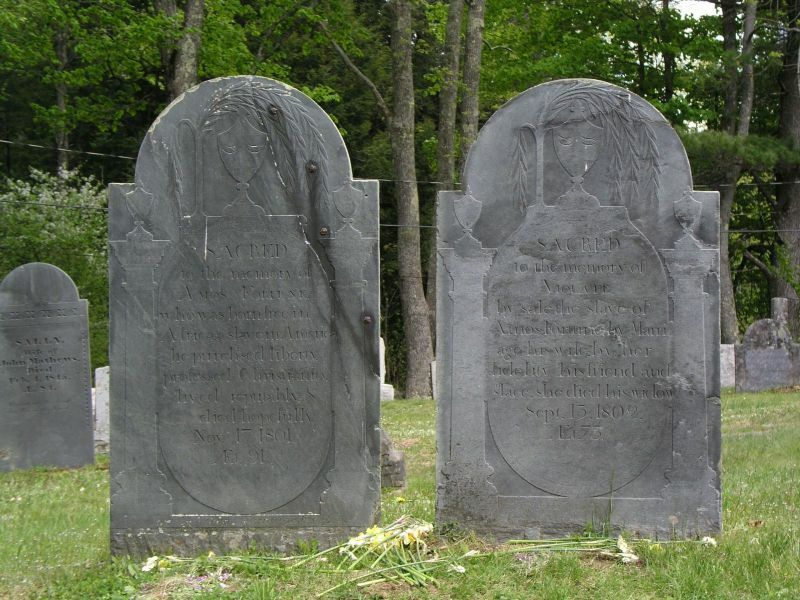 By most contemporary accounts, there was indeed a man named Chocorua who died in 1725. From there, the reader will have to make shift. Some say that Chocorua’s boy was accidentally poisoned by a concoction intended for foxes, and that, at the fateful moment when the Abenaki stood facing the musket muzzle, he uttered a curse that killed off livestock in the following years. The animal deaths really happened, too but it was discovered that muriate of lime in the local wells poisoned the animals. If you are of a less romantic bent, you might buy the simpler story that Chocorua was a victim of bounty hunters who carelessly, maliciously, or greedily targeted an Indian who had always kept cordial relations with the settlers. A theory bearing less controversy than either of the above suggests that Chocorua died in a hunting accident, or simply fell from the peak. However Chocorua’s soul left this world, his legend remains. Chroniclers, poets, and painters all immortalized this poignant battle of Native versus Settler. Thomas Cole, influential artist of the Hudson School, painted Chocorua’s Curse, which depicts the final scene’s drama quite poignantly. Author Lydia Maria Child and poet Henry Wadsworth Longfellow both modeled works after the legend, and respected White Mountain historian Frederick W. Kilbourne recorded a version of the curse in his Chronicles of the White Mountains.